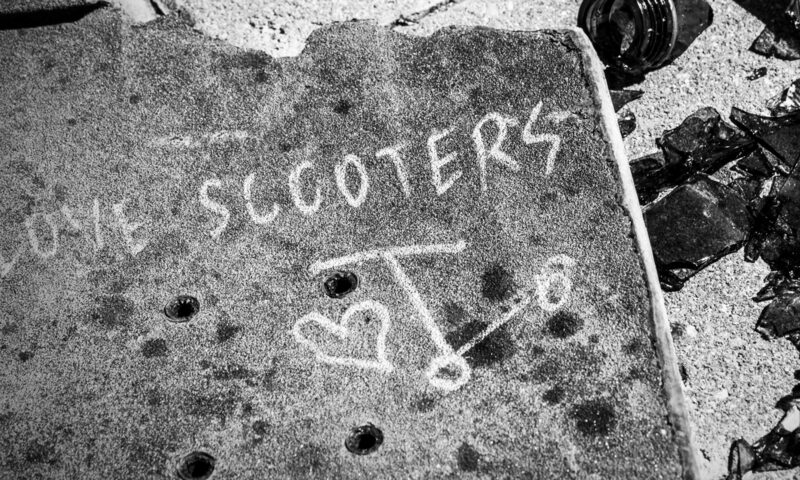 With electric scooters for adults becoming more and more popular these days it might take you some time to find the perfect one for your needs. If you start by looking at the EVO Powerboard range from Puzey Design you will see that you can find a great looking machine with a lot of useful features. The 1000W Big Wheel model is a great place to start looking if power and sporty looks are among your list of priorities. 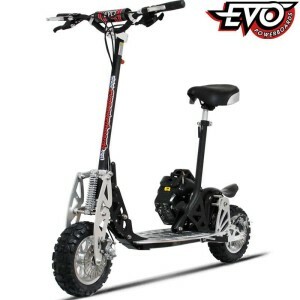 The EVO 1000 big wheel model gives a lot of power to the rider using it. In fact, you can go up to a maximum of 42 km/h (26 mph) in this model if you push it to the limit. It is the highest speed you can get up to in any of the EVO Powerboard range, having taken over from the older 800w model in this respect. This power comes from the 3 batteries on it which add up to 1000w and will have you racing along for around 10 miles or so before you need to charge them up again using the recharger which comes with it. The batteries should last you for more than 250 recharge cycles in total. Among the stand out features of this model are the giant 10 inch sporty alloy wheels. These fantastic looking wheels come complete with dual sport on/off road tyres too. The maximum load for this scooter is 265 pounds, which is around 120 kilos. Apart from the speed and the looks, there are also some very nice practical touches to look at here. For example, it comes with a clever one touch storage system which lets you fold it down to a much smaller size with just the one touch. This makes it ideal for a number of uses, such as riding it to work and then storing it in the office or getting the train and stowing it away while you travel. The fact that it is only weighs 40 kilos means that storing it shouldn’t be too much of a hassle for most of us either. The vehicle also has an impressive suspension, with a full 3 inches of travel on the swing arm type suspension giving a comfortable ride. The off road tyres are also going to be extremely useful for anyone who enjoy a bit of adventurous riding, although for standard inner city travelling there is no real benefit to be had from them other than the fact that they look so good. If you are worried about the battery life being a bit short for your needs and lifestyle then the economy mode button could come in handy, as it helps you make the juice last that bit longer. The relatively modest battery life and the fairly long battery charging time of 4 to 8 hours means that you will need to be relatively well organised in order to not find yourself left without the use of scooter now and then. If you get carried away and use it a lot during the day then you will need to stay alert enough to get it back up to the fully charged status for your new bout of riding. Everything else is pretty much as good as you would expect to find on any electric scooter for adults and if you are looking at different models you are likely to rate this as being one of the best around, if not the very best. Who would want this electric scooter? This is an electric scooter which will have a pretty wide ranging appeal for all adults. For instance, an office worker who wants to make their commute to work a bit more environmentally friendly and a lot more fun might be tempted to give this mode of transport a try. As long as the daily trip isn’t too far and the owner gets those batteries recharged on a regular basis this could make commuting much more enjoyable than ever before! The fact that this model has a lot of power, a high top speed and those chunky, sporty wheels means that adventurous types who want to get away from the city and feel the wind in their hair could also be possible purchasers. Also, the fact that it is comparatively light and easy to store means that it is ideal for taking in the car or on the train on a day out. 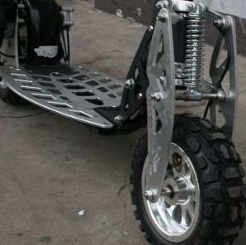 It’s an electric scooter which has been designed for enjoyment by adults of all ages and this shows in the both the look of it and the functions which have been added to it. Who is this electric scooter not for? This kind of electric scooter is sure to draw plenty of looks from passersby and car drivers as you power along the streets. If you don’t want to attract attention to yourself then this isn’t the vehicle to do it with. Unless you are planning on only using it on quiet streets or away from the city then you might find that it causes just too much of a stir when you use it. Anyone who is looking for a way to get around because of some sort of physical problem should also be sure that the weight and size of the EVO 1000w Powerboard Big Wheel isn’t going to cause them a problem, as there are smaller, lighter and less powerful alternatives on the market. Apart from that, it has a design and a range of functions which should appeal to most adults. Do you need a licence/tax/insurance/MOT for these mate? To follow up on this reply – you can now get road legal electric scooters, and you only need to register them with the DVLA for £55. I need a, not too expensive, very robust, low speed, stand-up adult scooter.